At least 25 people, mostly women and children, were killed, and 49 others injured in an explosion near Cairo’s Coptic Christian Cathedral. No one has yet claimed responsibility for the blast – the deadliest attack on Egypt's religious minority in years. At least six children were among the dead, Reuters reported, citing security sources. The blast happened as Sunday Mass was about to end, AP reported, adding that this weekend it coincided with a national holiday marking the birth of Islam's Prophet Muhammad. The explosive device contained at least 12 kilos (26 pounds) of TNT, Reuters reported. The bomb was reportedly placed in a female handbag in a seat in the back of the church, and the explosion hit the section where female worshipers mainly stood, which is why the majority of the victims are women, Egyptian reporter for The Washington Post, Heba Farouk Mahfouz, posted on Twitter. “I found bodies, many of them women, lying on the pews. 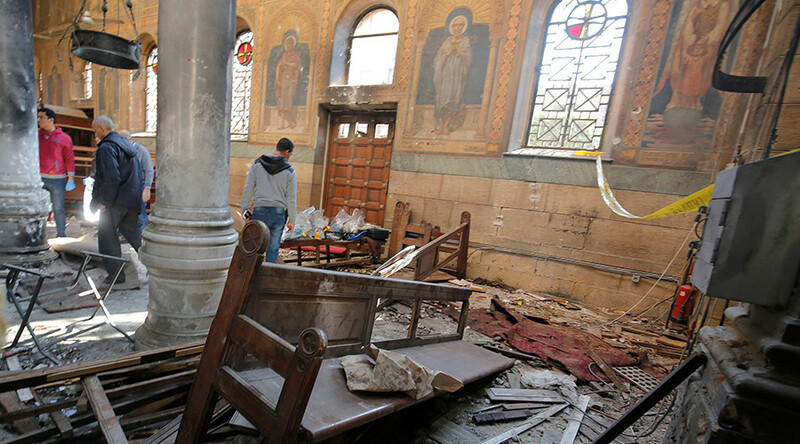 It was a horrible scene,” said cathedral worker Attiya Mahrous, as cited by AP. The bomb exploded at a chapel that adjoins the main hall of St. Mark's Cathedral in Cairo, which is the largest Christian church in the Egyptian capital. The cathedral is the seat of Egypt's Orthodox Christian Church and home to the office of its spiritual leader, Pope Tawadros II, AP reported citing Egypt's official MENA news agency. Several hundred people reportedly gathered outside the cathedral after the attack, AP said. The protesters were chanting anti-government slogans and demanded the resignation of Egypt's interior minister. Riot police have been deployed to the scene. A three-day mourning period has been announced in Egypt. Russian President Vladimir Putin has offered condolences to his Egyptian counterpart, the Kremlin press service said. Remarking that the Sunday attack was “especially deplorable” as there were women and children among the victims, Putin added that the international community should stand together in its efforts to uproot terrorism. The latest attack comes two days after two roadside bombs, one in Cairo and one to the north of the capital, left six police officers dead and six others injured. The bombing is the latest attack against the Christian population in Egypt – 10 percent of the country's 90 million people. In May, a mob of Muslims stripped naked and beat an elderly woman, and then paraded her through the streets of an Egyptian village, following rumors of a Christian man having an affair with a Muslim woman. Over the past years, criminal gangs targeted well-off Christian families, kidnapping their children for ransom. Muslim men in Egypt are also known to have kidnapped young girls, forcefully converting them, and hiding them until they become adults.